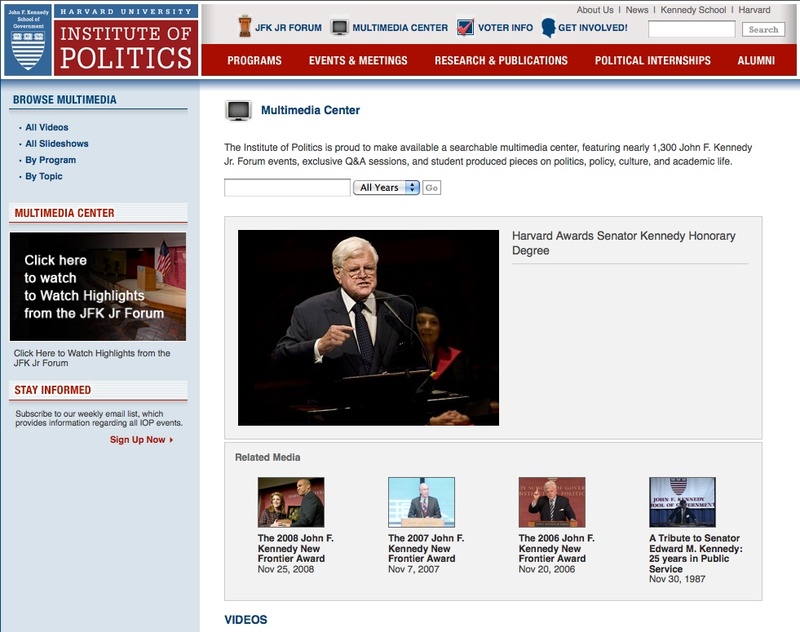 The Multimedia Center at the Harvard Institute of Politics (IOP) has a collection of video-documents of all the symposia, lectures and other events organized by the Institute since the beginning of its activity as a memorial to President Kennedy. The site today is a database of thousands of videos from 1978 onwards, with all relevant IOP events, including the nearly 1,300 videos of the John F. Kennedy Jr. Forums events. It is easier to access these on the Forum site, however, using the link on the homepage. There are also numerous interviews with prominent political practitioners, such as the series on “Why Politics Matters”. The videos are organised by topic, with 11 macro-themes and 90 subsections – and by syllabus, where the videos are in order and can be looked up by year. There is also a search engine on the home page allowing search by date. Videos are freely available for viewing in realtime format, though reproduction is often poor. The lectures are not embedded, and there is no accompanying material such as an introduction to the content or the speaker. There are links below the video-frame leading to other contributions on the site by the individual speakers and to related subjects. Despite frequent navigation and content problems, the site is a valid resource in terms of the quantity and importance of the material available.